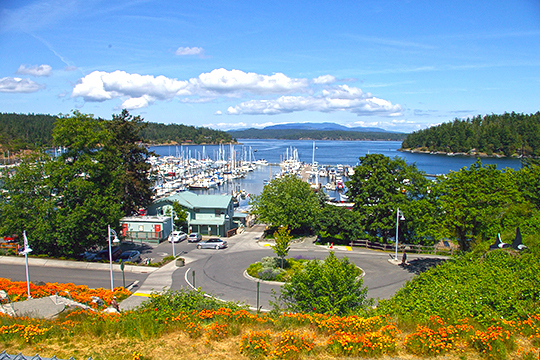 Photo: Friday Harbour Viewed from the VFW overlook. Photographed by User:Konrad Roeder (own work), 2007, [cc-by-3.0 (creativecommons.org/licenses/by/3.0)], via Wikimedia Commons, accessed January, 2013. The San Juan County Courthouse administrative offices are located at 350 Court Street, Friday Harbor, WA 98250; phone: 360-378-2163. Harry Towne, Jean Thomas, Winifred Ruthroff, Jay Hurlbutt and Joann Blalock with Mark L. Brack, Theatre Group, Straights of Juan De Fuca, San Juan County Courthouse, Friday Harbor, Washington, nomination document, 1983, National Park Service, National Register of Historic Places, Washington, D.C.